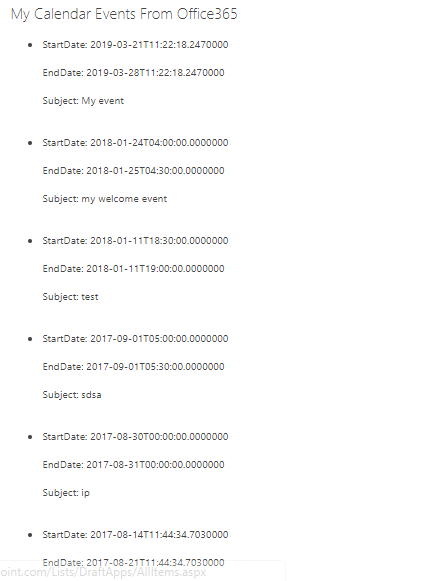 In this article, I have explained how to fetch events from the calendar for a particular user in SharePoint with the help of Microsoft Graph API. In my previous articles, I have written about site collection, user properties, fetching access tokens, retrieving and sending emails, and lots more. I have added the links below for your reference. Please go through these before following the steps given in this article. Tested in the Graph Explorer, it returns the JSON data like below. In this article, we are going to retrieve events from Office 365 Calendar. Please follow my previous article, How to fetch access token, to authenticate your web application to fetch the access token and authenticate. The successful response is shown below. Then, apply .map to iterate over the JSON data and display it on the page. The final result is shown on the screen below. I have printed some basic infomation to HTML. So now, we are able to retrieve the events from Office 365 Calendars using Microsoft Graph API.